The average land given to the rural landless is small and falling, from 0.95 acres in 2002 to 0.88 acres in 2015 - a 7.4 per cent drop over 13 years–and a slowdown is evident in the process of taking land away from rich landlords, the RTI data reveal. Almost three decades ago in 1990, Radheshyam, 49, was given half an acre of farm land free, taken away from a landlord as part of what was then a 40-year-old state law that allows distribution of such land to the poor. One of 5.78 million beneficiaries of land redistribution nationwide, Radheshyam - he uses only one name - got his land within 45 days of being shortlisted by the gram sabha (village council) in his village of Bebar in the western Uttar Pradesh district of Mainpuri. For the next five years, Radheshyam grew foodgrain on his half acre, which yielded about eight quintals of rice and six of wheat every year. After buying fertiliser, pesticides, manure and water, the land provided mainly enough for his family of eight. In 1995, rainwater filled a nearby pond and flooded his land. Since then, Radheshyam moved to Agra, 113 km to the west, and worked whatever job he could find. Steeped in debt, he now believes that the land he - and others in his village, of about 310,000 statewide - got after the Uttar Pradesh Zamindari Abolition and Land Reforms Act, 1950, was too little to change his life. Radheshyam’s situation reflects the general failure of a 54-year-old Indian programme to take land from the rich and give it to the poor. No more than 4.9 per cent of farmers control 32 per cent of India’s farmland. A “large” farmer in India has 45 times more land than the “marginal” farmer. 101.4 million - or 56.4 per cent - of rural households own no agricultural land. Only 12.9 per cent of land marked - the size of Gujarat - for takeover from landlords was taken over by December 2015. Five million acres - half the size of Haryana - was given to 5.78 million poor farmers by December 2015. What has largely failed nationwide - with the exception of West Bengal - over 54 years since a land-redistribution law was passed is not likely to improve, according to data in a response this correspondent received to a right-to-information (RTI) application filed with the Department of Land Resources of the Indian government’s ministry of rural development. As of December 2015, land declared “surplus” (meaning, it could be taken away from landlords) across India stood at 6.7 million acres; the government took over 6.1 million acres; and distributed 5.1 million acres - less than half the area of Haryana, or five-and-a-half times the area of Goa - to 5.78 million people. Similarly, the land declared surplus has fallen over the years. Between 1973 and 2002, an average of 150,000 acres was declared surplus, and an average of 140,000 acres was distributed every year. In contrast, between 2002 and 2015, the land declared surplus every year was 4,000 acres, while land in government possession and distributed declined by 29,000 acres and 24,000 acres per year, respectively. 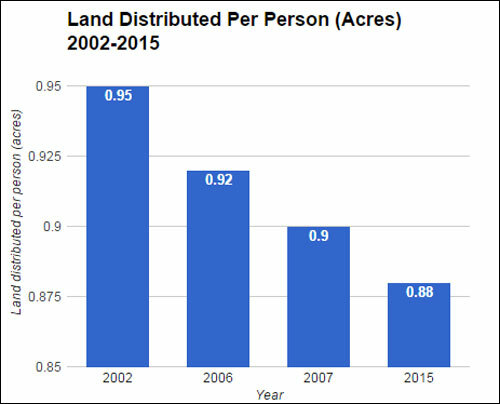 This means that there is less land declared surplus every year over the past 13 years and what was once a growing trend of government possession and distribution has reversed. The slowdown and fluctuations in land-distribution data over the years are usually because of disputes over how much is to be taken away; courts restored some land to original owners; and some land was unfit for cultivation, according to this 2009 report from the Centre for Rural Studies, Lal Bahadur Shastri National Academy of Administration (LBSNAA), Mussoorie. The surplus land under litigation increased by 23.4 per cent, from 920,000 acres to 1.14 million acres between 2007 and 2009. Some states, such as Kerala, Andhra Pradesh, Tamil Nadu, Karnataka, Gujarat and Maharashtra, created land tribunals to quickly settle such cases. 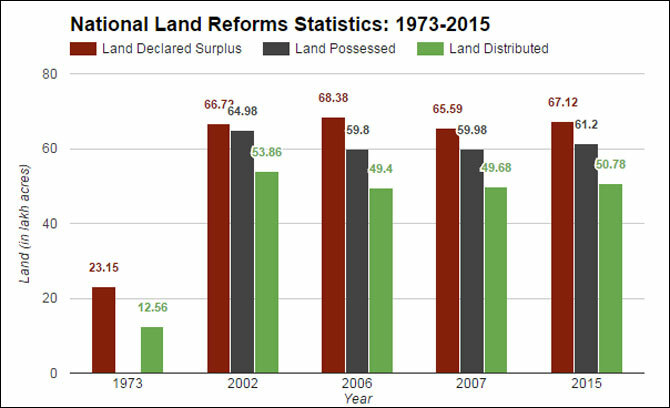 Irrespective of the fluctuations, the land declared surplus, up to 2015, is 12.9 per cent of 51.9 million acres - almost the size of Gujarat - the land that should be taken away from landlords, the LBSNAA estimated as cited in the report of the Committee on State Agrarian Relations and Unfinished Task of Land Reforms from 2009. The land in government possession and land distributed is 11.7 per cent and 9.8 per cent, respectively of the 51.9 million acres that should be declared surplus. Almost three decades ago in 1990, Radheshyam, 49, was given half an acre of farm land free in his village of Bebar in the western Uttar Pradesh district of Mainpuri. In 1995, rainwater filled a nearby pond and flooded his land. Since then, Radheshyam moved to Agra, 113 km to the west, and worked whatever job he could find. Steeped in debt, he now believes that the land he got after the Uttar Pradesh Zamindari Abolition and Land Reforms Act, 1950, was too little to change his life. As many as 570 million Indians, or 47.1 per cent (including 6.7 per cent in urban areas), still depend on agriculture, which contributes 15 per cent to Gross Domestic Product (GDP), according to this 2011-12 National Sample Survey Office 2011-12 report and 2011 census data. South Korea and Taiwan - and Japan before them - implemented sweeping land reforms before transforming agriculture and moving their people to manufacturing, Jayati Ghosh, a professor at the Centre for Economic Studies and Planning, Jawaharlal Nehru University, wrote in this 1997 column for the Economic and Political Weekly. As agriculture’s importance diminished, agricultural productivity kept rising. “This was not only because of the institutional changes which released productive energies, but also because of the role of the government in increasing public investment levels in agriculture, providing subsidised fertiliser and pesticide inputs, supporting agricultural research and extension services, assisting in the organisation of co-operatives, and similar measures,” Ghosh wrote. But as India tries to ramp up manufacturing - through programmes such as Make in India - the failure of land reforms may worsen rural poverty. As many as 95.1 per cent of Indian farmers are called “marginal, small and semi-medium”, meaning they own up to 2.47, 4.94 and 9.88 acres of land, respectively. 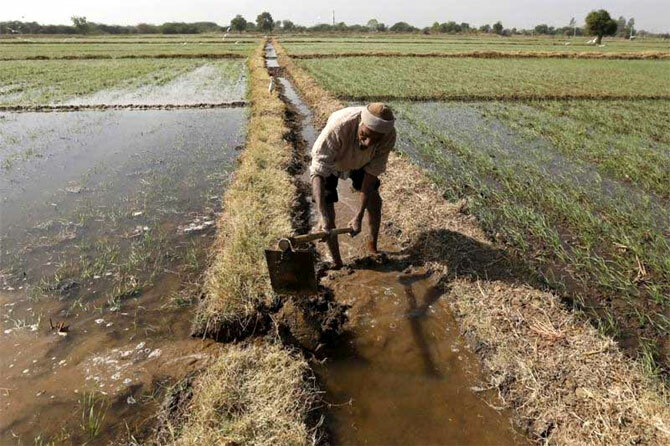 These farmers own 68.2 per cent of cultivated land, while 4.9 per cent “medium and large” (owning up to 24.71, or more than 24.71 acres, respectively) farmers own 31.8 per cent of cultivated land, according to the 2011-12 agriculture census. A “large” farmer on average has 45 times more land than a “marginal” farmer, as we already said, and 101.4 million - or 56.4 per cent - rural households own no agricultural land, according to the socio-economic caste census 2011. A national law that guides the land a farmer can own was passed in 1972. It recommended that farmers should own between 10 and 18 acres of irrigated land with two crops, 27 acres of irrigated land with one crop and 54 acres for dry land. The surplus land was to be taken away by state governments and distributed to the rural landless, identified by village panchayats. 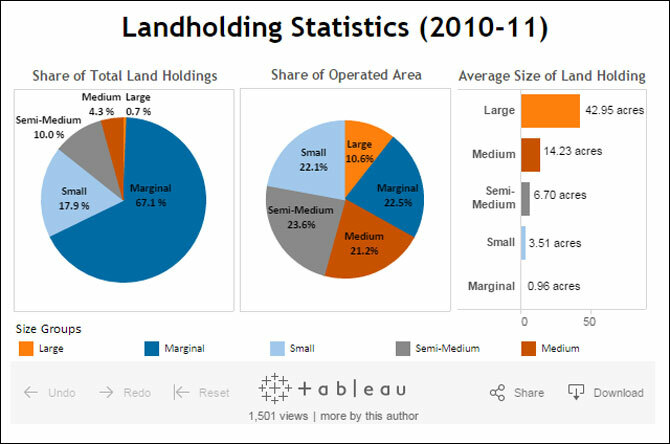 Land ceilings varied by state and land quality. The RTI response received by this correspondent reveals that West Bengal has outperformed other states. It has declared the most land “surplus” (1.41 million acres, or nearly one-and-a-half times the area of Goa), and accounts for 21 per cent of such land so declared nationwide. West Bengal has taken possession of 1.32 million acres, 93.6 per cent of land declared surplus statewide, and distributed 1.05 million acres, 79.8 per cent of the land in the state’s possession. West Bengal also accounts for more than half (54.2 per cent) of India’s land-reform beneficiaries. As many as 3.14 million of the rural, landless got free land over 60 years. The Draft National Land Reforms Policy has credited West Bengal, Kerala and Jammu and Kashmir for having performed best in surplus land distribution. Jammu and Kashmir is the worst performer, according to data from the RTI reply, which is also riddled with inaccuracies. For Jharkhand, it says no “surplus” land was declared and taken over - yet it shows 860 acres distributed among 1,316 beneficiaries. For Karnataka, land distributed is more than that declared “surplus” and taken over by the government. For Punjab, land taken over and distributed is more than land declared surplus. These inconsistencies raise concerns over the reporting and verification of surplus land declaration and distribution nationwide. A database of land inventories available for public scrutiny.